Heat water and boil chopped potatoes until soft. While potatoes are boiling heat mirepoix mixture, add frozen vegetables and zucchini. Pour vegetable broth into the vegetables and stir in whole wheat flour, tomato paste and Worcester Sauce. Once you have your sauce mixed into the vegetables add the rosemary and thyme. Drain boiled potatoes and mash. Stir in some unflavored soy milk, 1 tablespoon of garlic, 1 tablespoon of nutritional yeast and pepper. NOTE: I used a mixer to get a nice, smooth consistency in the potatoes. I also left the skins on. Pour vegetable mix into 9×13 Pyrex pan and spread evenly. Scoop mashed potatoes into pan, smoothing as you go. Top with a sprinkling of paprika. Heat the oven to 400 and cook for 15 minutes. Heat the over to 400 degrees. Fold corn tortillas in half and place them between the oven rack and heat for 10 minutes. This will give you a crispy taco shell. 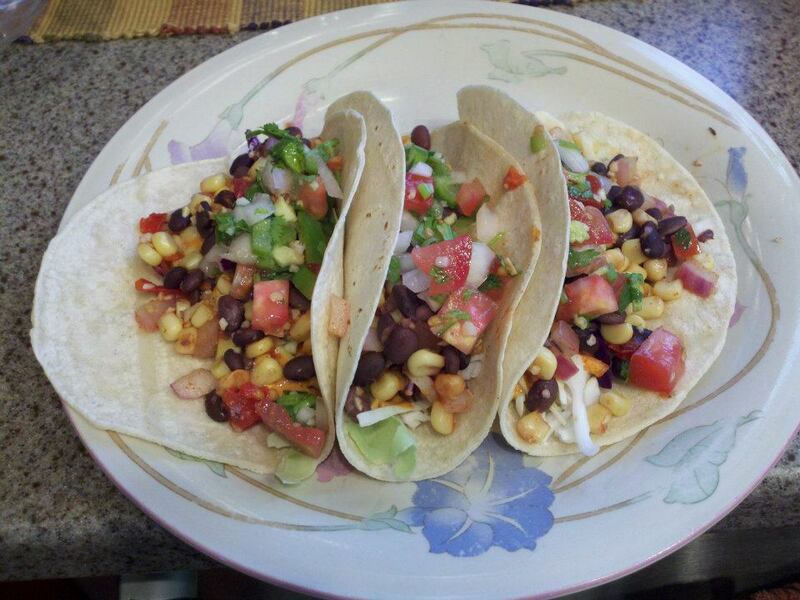 Fill shells with lettuce or cabbage, drip chipotle nayonaise and top with fresh pico de Gallo. Notes: The other option for the corn is to roast 3 ears of corn on the BBQ, cut the corn off the corn and add it to the pan.